It’s time to make the move from ordinary TV to the ultimate viewing experience of high definition. Let the brilliant clarity of HD transform your everyday programs into a spectacular line up broadcast in the same quality you would expect to find only in theaters. DISH Network makes it possible for everyone in Austin, Texas, to enjoy the exceptional quality of HD, and with package and pricing options that are sure to fit every size budget.DISH Network subscribers have access to over 130 channels available in HD across a variety of DISH Network packages. You won’t ever have to give up your favorite local channels to get HD programming. Local DISH Network channels available in HD include ABC-KVUE Channel 24, CBS-KEYE Channel 42, NBC-KXAN Channel 36, and FOX-KTBC Channel 7 for viewers in Austin, Texas. Local HD channels are subject to your address and require the necessary equipment and qualifying programming packages. Choose any base DISH Network package and receive HD free for life for as long as you maintain your subscription. There is no gimmick or misleading trial period, HD is guaranteed free for life only with DISH Network. 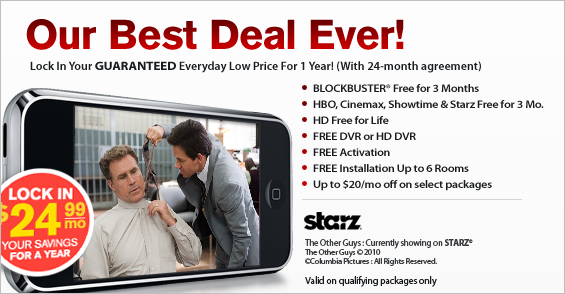 Call today and get a Free HD DVR Upgrade after you activate your account. Call for details!